how do i find alternative water on my farm? Does that remind you of last summer? Did you run out? The NWNY region is rich with water; the obstacle is getting it to where you need it. New York is home to 0.3% of the world's population with 2.0% of the world's surface water with roughly 8,000 freshwater lakes! Climate trends are pointing to longer growing seasons, so crops will need additional water. There will also be an increasing number of heavy rainfall events, and wetter spring seasons2. The water will be there, but management may need to be adjusted to meet the farm's needs. Over the winter I had questions and comments about farms' water supplies for grazing. Some farm wells went dry so alternative sources needed to be developed. Here is a brief overview of some options. If you think of others, let me know! First, think of conservation. Fix leaks, reduce spills, make sure water troughs are level. Keep livestock cool with shade, or bring them back to the barn during the mid-day heat. Utilize pastures early, late and overnight. Have plenty of water available at the barn so they get their fill before heading out to pasture. You will need to estimate the amount of water needed by your animals. When temperatures are cool, pastures are lush, water consumption will be lower. As the temperatures climb and plants dry out consumption increases. Don't let water be your limiting factor to production! Quality is critical; some water in our area is very hard and can disrupt intake and metabolism. And, regardless of source, the water still needs to get to the animals. Ideally, an alternative source can be connected to your existing water lines. A quick fix would be a water wagon. If your current source is low, water can be hauled from a municipal well or other source. It can be hauled to a remote pasture that is used only occasionally. Hauling is time-consuming. I have talked with a couple of farms that are planning to install ponds as a water source. They can be collection basins for springs or rainfall. Placement and sizing is important, as well as soils and subsoils. 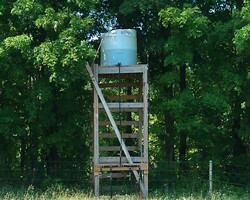 Depending on the topography of your farm, proper placement would allow gravity flow to stock tanks. A small solar-powered or gas-powered pump can get the water to where it needs to go. Water could be pumped to a storage tank then gravity-fed. Is there a spring on the farm that could be developed? This is another option. A spring can form when a fracture occurs in an impervious rock layer. Water will seep out of the aquifer, through the crack and reach the ground until the aquifer level drops below the ground outlet. Springs can be collected into a pond or catch area then pumped to where water is needed. If you are fortunate enough to have a stream on the farm, maybe that is a source. Some waterways can have seasonal flow so use may be limited. Remember to limit livestock access or pump from the stream to prevent erosion and contamination problems. Maybe it is time to drill a new well. Again, placement is critical; it may be worthwhile drilling in a remote location or at the farmstead. A power source is needed to pump the water. Contact the experts for assistance! Your county Soil &amp; Water Conservation District or Natural Resources Conservation Service can help! Well drillers or dowsers can assist with placement. As weather patterns shift and our climate changes, maybe the future will point to pasture irrigation. 1Rime of the Ancient Mariner, by Samuel Taylor Coleridge.